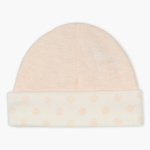 Get this attractive beanie cap for your little one and let it lend a classy look. Polka dots print with soft textured fabric is eye-catching. This cap is extremely comfortable to wear all day long.